Congressman Mike Rogers, who sits on the House Intelligence Committee, told a Michigan radio station that he thinks Pfc. Bradley Manning, if found guilty of giving classified military videos and documents to Wikileaks, should be executed for treason. 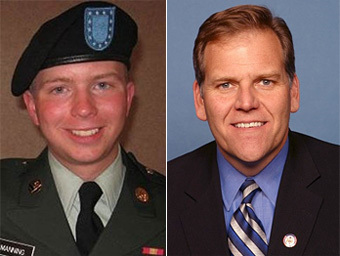 Manning (left), the private who allegedly used his security clearances to provide Wikileaks with the "Collateral Murder" video of a messy U.S. assault in Iraq and is a prime suspect over the leaking of tens of thousands of Afghan war diaries, is currently in solitary confinement in Virginia, awaiting all of his indictments. Rogers thinks his violations may constitute federal treason. Rogers said Manning put "tens of thousands" of American military members and allies abroad in danger by his actions. "He clearly aided the enemy to what may result in the death of U.S. soldiers or those cooperating. If that is not a capital offense, I don't know what is," Rogers said. Manning gave documents to Wikileaks for the purpose of shedding transparency on the wars. Is that enough for treason?